Rescued corals in quarantine tanks at Florida Aquarium’s Apollo Beach Conservation Center are monitored closely for signs of stress from being transported. They will remain at the aquarium until long-term care facilities are able to house them. During a technical exchange in December 2018, a CONANP representative from compares stony coral tissue loss disease on the Florida reef with a similar disease outbreak at Xcalak Reefs National Park in Mexico. Buoyancy is key to preventing the spread of stony coral tissue loss disease. Jennifer Stein, FWC biologist, places a brain coral into a mesh collection bag as part of a coral rescue mission ahead of the disease front in the Lower Florida Keys. Signs of stony coral tissue loss disease on Symmetrical Brain coral (Pseudodiploria strigosa). Tissue loss on this large colony of Great Star Coral (Montastaea cavernosa) is nearly total. A small colony of Great Star coral (Montastraea cavernosa) showing signs of stony coral tissue loss disease. The recent death of the brain coral in the foreground indicates the diseased coral next to it will likely suffer the same fate. Looe Key, July 7, 2018. Florida Keys National Marine Sanctuary marine biologist Lonny Anderson identifies a healthy, rare pillar coral sqawning in July 2018 near Looe Key. Coral Rescue cactus coral - Cactus coral is among the species being collected from reefs ahead of the disease front in the Lower Florida Keys as part of the coral rescue mission aimed at preserving genetic diversity. Coral Rescue KML - Rob Ruzicka, FWC Fish and Wildlife Research Institute, and Jennifer Moore, NOAA Coral Recovery Program, survey the Keys Marine Laboratory collection from the initial coral rescue mission in response to the stony coral tissue loss disease outbreak. An advisory committee member from Scorpion Reef National Park sees firsthand the effect of stony coral tissue loss disease on the Florida reef as compared to the disease outbreak on the Mexican reef tract. Rescued corals are mounted with epoxy on terracotta tiles to prevent their tissue from being damaged by touching the bottom of the tank. Diver observing a healthy Grooved Brain coral (Colpophyllia natans) in the Florida Keys National Marine Sanctuary. During the July 2018 coral spawn, Linda Penfold with The South-East Zoo Alliance for Reproduction and Conservation prepares pillar coral gametes for gene banking in partnership with the Florida Aquarium. Time series photos over five days show the rapid tissue loss on an infected coral. A scientist creates a trench filled with chlorinated epoxy to treat a colony of Mountainous Star coral (Orbicella faveolata) impacted by scleractinian tissue loss disease. Mote Marine Laboratory on Summerland Key developed a micro-fragmentation and fusion method to speed the growth of crucial reef-building species. Coral Rescue Rob Ruzicka - FWC Fish and Wildlife Institute diver Rob Ruzicka bags one of several species of coral targeted for rescue to maintain genetic diversity in the wake of the stony coral tissue loss disease outbreak. In January 2019, science divers confirmed that the outbreak of stony coral tissue loss disease on the Florida Reef Tract extends south and west of Key West. In December 2018, signs of disease were observed at Maryland Shoals near the Saddlebunch Keys and Middle Sambo Reef, south of Boca Chica Key. By mid-January, an additional five sites between American Shoal and Eastern Dry Rocks were confirmed diseased. Managers from four Mexican marine national parks visited the Florida Keys in December 2018 to learn about stony coral tissue loss disease, which they now strongly suspect is affecting reefs in the Mexican Caribbean. Other Caribbean resource managers have expressed similar concerns. Mexico has initiated a regional monitoring program and is actively networking with international colleagues. The visitors saw first-hand the impact of the disease on Florida's coral reefs, and the likely cascading impacts on fisheries and tourism. They also examined management strategies such as dive gear disinfection. Marine national park managers in the region are connected through MPAConnect, a partnership among the Gulf and Caribbean Fisheries Institute, the NOAA Coral Reef Conservation Program and 30 Caribbean marine national parks. The interventions being employed against stony coral tissue loss disease on the Florida Reef Tract found a spotlight at Reef Futures, the first global conference addressing coral restoration and intervention science. The groundbreaking symposium, held in Key Largo, Florida, Dec. 10-14, 2018, tackled the challenges facing coral reefs globally by sharing available solutions, promising new research, and experimental techniques. A number of scientists involved in the collaborative response to stony coral tissue loss disease shared their findings and welcomed assistance in addressing the historic outbreak. While immediate and aggressive action on climate change is paramount for the long-term survival of reefs, conference participants concurred that repopulating degraded reefs with resilient, genetically-diverse, and reproductively-viable corals is also essential. Recognizing the urgency of the coral disease threat and the fact that the strategies and in-water techniques used to combat stony coral tissue loss disease will have implications far beyond Florida, FORCE BLUE is committing to supporting the Florida Department of Environmental Protection and Florida Keys National Marine Sanctuary. The nonprofit organization of former military divers will spend the winter of 2018-19 in the Florida Keys assisting with disease interventions and other response efforts. The authors of a paper published in Frontiers of Marine Science describe the stony coral tissue loss disease outbreak as an "ecosystem altering event" in Southeast Florida. Using population data from the Southeast Florida Coral Reef Evaluation and Monitoring Project (SECREMP), the study showed lower stony coral diversity, density and live tissue area related to increased disease prevalence from Miami-Dade to Martin County. 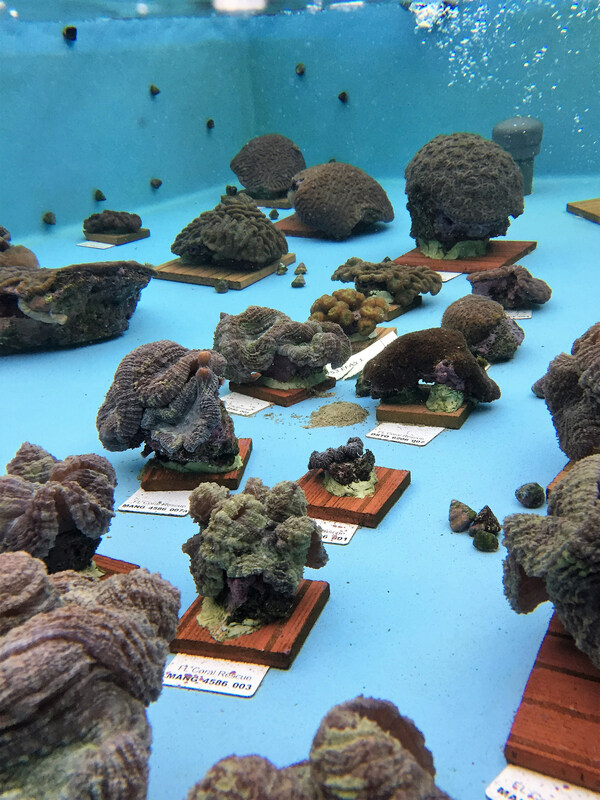 The study noted particularly steep declines in some susceptible species including Maze coral (Meandrina meandrites), Elliptical Star coral (Dichocoenia stokesii), Great Star coral (Montastraea cavernosa) and Massive Starlet coral (Siderastea siderea), but also described increases in 'weedy' coral species such as Mustard Hill coral (Porites astreoides), Finger coral (Porites porites) and Lettuce corals (Agaricia spp). During an initial coral rescue mission in mid-September 2018, divers collected 88 colonies of corals in the Lower Florida Keys ahead of the disease front. The corals, representing 10 species susceptible to stony coral tissue loss disease, are banked to preserve genetic diversity for future restoration efforts. The genetic management plan in response to the disease outbreak calls for the collection of as many as 200 colonies of each susceptible species. On a routine site assessment of the Port of Miami Anchorage Area, Florida Department of Environmental Protection divers found apparently healthy colonies of two of the most susceptible species to stony coral tissue-loss disease: one colony each of Maze Coral (Meandrina meandrites) and Symmetrical Brain Coral (Pseudodiploria strigosa). The team also found two apparently healthy colonies of Great Star Coral (Montastraea cavernosa), a species that often suffers from longer-term, chronic infections. The anchorage is situated in an area that has been impacted by this disease for nearly four years, suggesting that these corals are either exceptionally lucky or somehow are resistant to the disease. The colonies may prove vital to reseeding Southeast Florida reefs with these increasingly rare species. A collaborative Mote Marine Laboratory and Florida Institute of Technology study suggests that deeper, diverse coral reefs are at a greater risk of being affected by stony coral tissue loss disease. The conclusions will inform management decisions in response to the outbreak. Read the full report. The Florida Keys are known for their lush coral reefs and incredible biodiversity. Protected by Florida Keys National Marine Sanctuary, the Keys support more than 6,000 species of plants, fishes, and invertebrates. But in the past few years, something has been targeting corals. Florida Keys National Marine Sanctuary, Florida Department of Environmental Protection, and the NOAA Coral Reef Conservation Program held a workshop on July 11-13, 2018, in Key Largo to create a comprehensive response plan to address the coral disease outbreak. The workshop focused on developing collaborative partnerships between resource managers and scientists to identify potential pathogens, document the outbreak, understand contributing factors, and aggressively pursue interventions. We are quickly compiling the workshop outcomes to create a framework for adaptive decision making about intervention actions, resource capacity and funding needs, regulatory issues and community engagement.